Mainstream TV got you down? Did your (former) favorite show kill off your favorite and its only queer female character? Don't worry, it's independent media on the web to the rescue! If you’re a fan of ladies loving ladies on TV like I am, it’s been a rough start to the television season thus far. Don’t worry, this post isn’t about dwelling on the trauma. In a moment, I’m going to talk about queer ladies who not only survive their stories (Imagine!) but lead them. But first, let’s review the 2014 television season so far. Not only have viewers suffered through breakups like Grey’s Anatomy‘s Callie and Arizona and Rookie Blue‘s Gail and Holly, but, in an even more disturbing continuing trend, we also witnessed the deaths of queer female characters. Chicago Fire‘s tough and snarky resident lesbian, Leslie Shay, was killed off at the start of the show’s 2014 season. And Arrow‘s badass bisexual League of Assassins member, Sara Lance, met her end not too much further into the season. Agents of S.H.I.E.L.D. didn’t even give viewers time to get attached to its presumably queer character. The show introduced Isabelle Hartley, a character who has been portrayed as queer in comics, then promptly killed her off before viewers got a chance to know her. This was after doing pretty much the same thing to another queer comic character, Victoria Hand, the season before. These deaths were disappointing not just as a loss of representation but because these women’s deaths were less about their own journeys as characters and more about furthering the stories of other characters on the canvas. The reasons this trend and these particular examples of it are problematic could be a series of blog posts all on its own, but I’m in a positive spin kind of mood today. So, instead, I’m going to talk about where you can find queer women starring in their own stories. I’ll give you a hint: they’re in your computer. If you have yet to delve into the wonderful world of web series, there’s no time like the present. If you’re frustrated with the lack of queer female representation on your television, you’re not alone. But fortunately, there’s a whole wide world of queer female-fronted stories out there on the World Wide Web that offer viewers all the things television is lacking. I’m here to tell you about five of my favorites. Beacon Hill boasts a ton of deliciously devious political and familial scheming and backstabbing. At the center of it all is reporter Sara Preston. Sara returns home when her grandfather, Senator William Preston, falls ill. Sara’s work to get the scoop on her grandfather’s replacement in the senate is complicated by the fact that her grandfather’s scheming is what drove her out of town in the first place and that her family wouldn’t know a healthy emotional bond if one knocked them on the head. Oh, and the top contender to take Senator Preston’s seat in the senate just happens to be State Representative Katherine Wesley, Sara’s ex-girlfriend. If you like intelligent drama that keeps you guessing and flawed characters in many shades of grey, this is the show for you. It’s superbly cast, and the use of flashbacks to Sara and Katherine’s happy days as a couple gives the viewer plenty of reason to root for them to work through their angst in the present. Not only that, the familial relationships on the show are fascinating and add multiple layers of complexity and drama. Cost: $9.99 gets you unlimited access to season one of the series. Carmilla was a 1871 novella by Joseph Sheridan Le Fanu about a young woman’s susceptibility to the attentions of a female vampire named Carmilla. 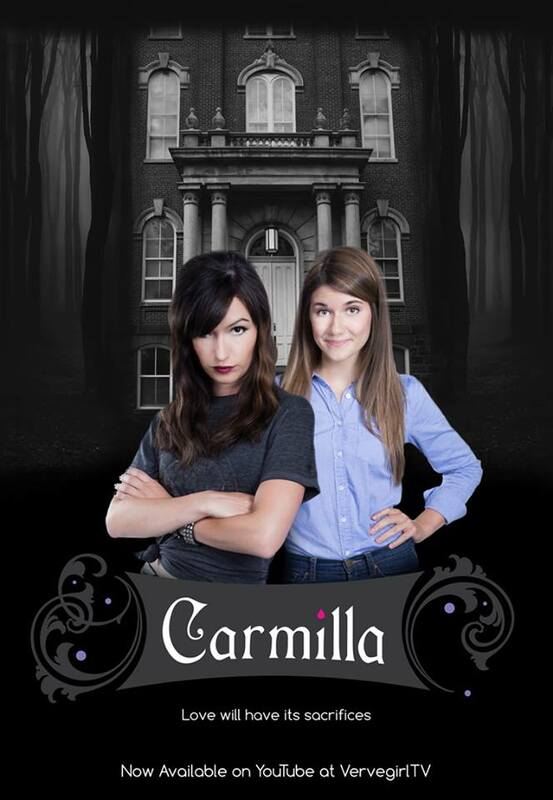 The web series of the same name assumes Carmilla is still alive today. Laura Hollis is a freshman at a university with a lot of mysterious supernatural activity going down. The incident that captures the budding investigator’s attention is the disappearance of her roommate, Betty. Laura suspects her replacement roommate, Carmilla, might have something to do with Betty’s disappearance, and she records her investigation in a series of vlogs that make up the show. She recruits a group friends to help in her investigation, including her mutual crush Danny. But when it starts to look like Carmilla isn’t as guilty as she first appeared, Laura finds herself feeling sympathy and maybe something more for her dark and broody roommate. This is a smart young-adult drama with snappy dialogue and a ton of great characters. It’s very much in the vein of Buffy and Veronica Mars but heavier on the humor than either of those two examples. If you like fast-paced dramas with lots of humor and a touch of the weird, check this one out. Cost: Carmilla is free thanks to sponsorship by U by Kotex. This series follows a group of twentysomething friends who run the gamut from lesbian to bisexual to straight and focuses mainly on the state of their love lives. It’s a mix of comedy, drama, and documentary. Scenes from the characters lives are interspersed with a documentary crew who is asking the characters questions about love and dating. The great thing about this series is that each episode focuses on a different character, so there’s room to cover a variety of experiences. Viewers meet a character searching for love for the first time in one episode and in another episode meet a 40-something woman trying to date again after years of marriage have ended in divorce. This should be your pick if you like ensemble dramas with a wide variety of characters and stories. And don’t worry if you’re an English speaker, this French-Canadian drama has English subtitles! Cost: Féminin/Féminin is free and was supported by a fundraising campaign. Nikki and Nora are both romantic partners and partners as private investigators. The two former NOPD cops have a soft spot for the underdogs and the cases others might not take on. Nikki & Nora was originally a TV pilot in 2004. The show never made it to air, but the pilot leaked online, and ten years later, there was still so much fan interest, as well as a love of the series on the part of the creator and the lead actresses, that a web series was born. The web series sees Nikki and Nora taking on a case the NOPD has already closed. Their client is convinced her boyfriend was murdered even though the death has been ruled a suicide. The pair investigates their case while trying to renovate their home, sort out complicated family relationships, and solve the ongoing disagreement over which one of them gets to wear their favorite jacket. Also, Christina Cox and Liz Vassey, who play the title characters, should get an award for having off-the-charts on-screen chemistry. Seriously, I will make them the biggest, sparkliest trophy right now if someone can tell me where to send it. If you like crime dramas, a good dose of fun, humor, and an equal focus on the procedural and the personal, Nikki & Nora will not disappoint. Cost: $4.99 gets you a month of access to watch all of Nikki & Nora plus any of Tello’s other series. Tello had 13 shows up, some with multiple seasons, at the time of writing and is always adding new content. TH3M! focuses on a group of friends and lovers whose lives interconnect and overlap in a variety of ways. The show focuses on everything from romance to family, and there’s plenty of drama on both of those fronts. In the first episode alone, one character deals with her son who wants to move back in with his father while another character has to fast-talk her way out of a relationship with a woman who has just left her husband for her. If you like your relationship drama mixed with family drama of both the biological and chosen family variety, this show is a great choice. It’s also got the added bonus of a cast full of women of color, which I know is an area where the rest of my list is lacking. I welcome any other suggestions in the comments! These shows are just a few of my favorites . There’s a ton of great content on the web, and much of it is taking chances on different types of stories and offering the type of representation that mainstream television doesn’t. For example, if you’re a fan of soap opera-style drama, you may also want to check out this article on web soaps for some recommendations. If you’re like me, you might pause at having to pay for some of this content. I realize not everyone can afford to do so. However, if you have the money and something that charges a subscription fee interests you, I urge you to give it a try. Supporting independent creators is a great way to show what you value in your entertainment, and your support will likely help the creators make more of what you enjoy down the line. I’d love to hear your thoughts in the comments if you try out any of my picks, and I’d also like your suggestions if you have any must-watch web content that wasn’t on my list! What did I miss? Thanks so much for this. I’ve been wanting to try more web series, and this will really point me in the right direction, as it provides everything I need to know about the series before watching. I’m intrigued.